Miracle of Sound is back once again with an album full of songs written about games, TV programmes and films. 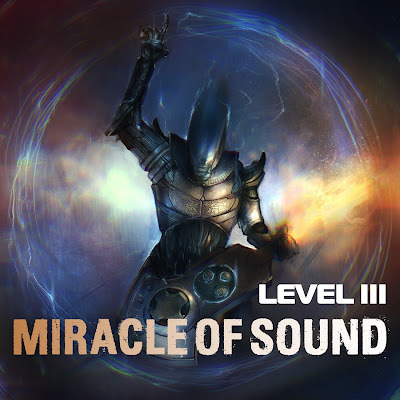 Composed and written entirely by Gavin Dunne who releases under his band name, Miracle of Sound, Level 3 features gaming tracks based on games such as Bioshock Infinite, Tomb Raider, Borderlands 2 and Assassins Creed III. As with the previous two albums, Gav embraces and experiments with plenty of different genres to fit with the tone of the game, programme or film he is singing about. For instance, 'His Father's Son' resembles a sea shanty blended with Native American influences-exactly like the game itself. Stand out tracks on the album include the newest release, Dream of the Sky, which is based on Bioshock Infinite, Breaking Down The Borders (Borderlands 2), The Savage Side of Me (Tomb Raider), The Best I Can (Telltale Games' The Walking Dead), and His Fathers Son (Assassins Creed III). The non-gaming songs are just as great, with 'Halfman's Song', about Tyrion Lannister from Game of Thrones, is one of the best tracks on the album. For me though, no Miracle of Sound album is complete without a tongue in cheek ditty, and thankfully, Level 3 delivers on this too. 'Wigglesticks' is a brief track mocking Resident Evil 6's over-reliance on Quick Time Events (I enjoyed that game, but come on, it was a little too much at times! ), 'The Call of Duty Circus' explains the typical type of Call of Duty gamers you'll encounter whilst playing online, whilst 'Doorfighter' is based on the plethora of door opening sequences in Medal of Honour. The Miracle of Sound: Level 3 album is available to buy as a digital downloaded copy via his Bandcamp page now. Easily one of the best albums I've ever bought, there's enough musiCal elements gOing on to keep any Listener happy. Several sOngS sTand Out as being, to put it MIldly, incredible. A special mention needs to go to "Dream of the Sky" - I've never has such an emotional reaction to a piece of music. So many different styles blend into a single, amaZing piEce of music. I simply cannot Recommend this album highly enough. And for only £6 it's an absolute steal.